As the temperature creeps higher up the thermometer, the countdown until Waldameer's 2010 season has finally reached the two week mark. Just hold out for fourteen more days and you and your family can enjoy all the rides, slides, games and treats you can handle! 1. A New Opening Time! - Once our season kicks off our regular hours of 1:00PM to 10:00PM, we thought you would enjoy a whole extra hour to enjoy some of our rides and attractions! Starting June 19th, half of Waldameer's rides will open at 12:00 NOON. That's 60 whole minutes more! 2. A New Night Rider Time! - Remember when you came to Waldameer at 6:00PM and thought, "Why doesn't Waldameer's Night Rider Discounted Ride Pass start now?" Well, now it does! We've rolled back the Night Rider time from 7:00PM to 6:00PM so you and you family can enjoy a whole extra hour of Waldameer fun! 3. Be a Kid Again! Senior Passes Now Available! - Now those of you 65 and older can feel just like a kid again! For only $16.95 you can ride and slide all day with our Discounted Senior Combo Pass. Now all you have to focus on is keeping up with the grand kids! Planning ahead at Waldameer takes vision and a whole lot of smarts. Seeing into the future is a learned talent, not a gift. While we wish rides came in little packets full of seeds, we have to seriously think through countless issues before deciding on expansion. Once the future vision id thought through, it is hard not to see it in the mind's eye. While most of Waldameer's focus is on this coming season with all its new and exciting additions, we can't help but plan for the future. 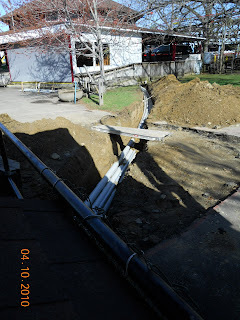 While trenching and digging up asphalt for pipes to hold wires in order for the new turnstiles to read wristbands, we found ourselves planning ahead for the future. 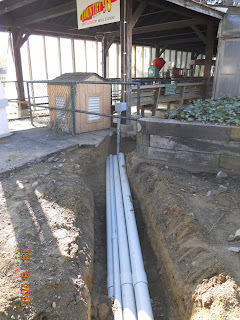 More pipes found their way into the freshly dug ground that are currently empty. Strange you may think. But this is all for a reason. That reason being our future plans for the Merry-Go-Round shelter and the area in front of it. Sources may tell you that down the road, the Merry-Go-Round shelter will become a one-of-a-kind Food Court full of many different varieties of food! This past carousel building will house many different meal options and have plenty of seating for you and your family to enjoy. But the future doesn't stop there... the area in front of the Merry-Go-Round shelter is said to be the home of a brand new thrill ride. Not much can be said about this new thriller but it will surely put your socks in a twist! So get excited, not only for this season but future seasons as well! And They're Off! Season Passes are Flying Off the Shelves! The time has come that many have been patiently waiting for... Waldameer's online store is open! 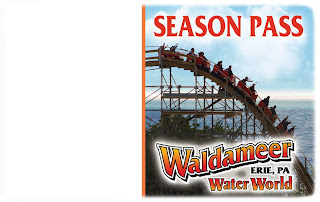 After much hard work behind the scenes and screens, waldameer.com is selling everything from Wally Cards to Season Passes right from the comfort of your computer. Purchase Gift Cards and give them as the perfect summertime gift or buy All Day Combo Passes for the whole family with only a few clicks of the mouse. Purchasing your tickets online is the best way to save time waiting in line and save money too! So start clicking to have one of the first E-tickets offered by Waldameer!